You likely cannot tell from the other side of the screen, but I am one of the shyest people you'll ever meet. I absolutely love being around people, but I am more of a listener, an observer. I rarely start conversations and if I am in a large group, I don't often contribute to the conversation. I've been in ministry most of my life, but I was more of a behind the scenes kind of gal. My husband was the one leading our children's ministry and I stayed back to assist him. But I couldn't possibly go in the front. I was in my late 20s before ever attending a women's Bible study and for the first year or so, I sat there very quietly listening and taking it all in, hoping no one would ask me to speak. Several years ago our church didn't have any women's Bible study and I desperately missed it. God told me to lead it. What!? I cannot possible lead a Bible study! I cannot talk in front of people like that. What if I mess it all up? Again, God said to lead it. So I did. Now, I love facilitating the women's Bible study at my church. I love bringing the women together to learn and go deep in God's Word. I love the tears we shed together and conversations we have. It is one of the greatest joys I have. Last year my husband, who was also the church's associate pastor, felt God calling him out of children's ministry. As he began to make steps toward leaving the children's department, I felt God telling me to step in. What!? I reminded God, because He must have forgotten, that I was shy, I couldn't lead an entire service for these kids. He said again to step in. Now, I've been a children's pastor, on my own, for over a year. I love every minute with my kids. Seeing my kids raise their hands in worship and learn things about God brings so much joy to me each week. I still have a long way to go. I still rarely start conversations and if I am in a large group, I still don't contribute too much. When I am asked to give an announcement in the adult service at church, I feel like I am going to pass out. But I have learned the incredible blessings and radical result of walking out in faith and obedience and living the life God plans, not what you plan. Tricia Goyer has learned this radical result too. 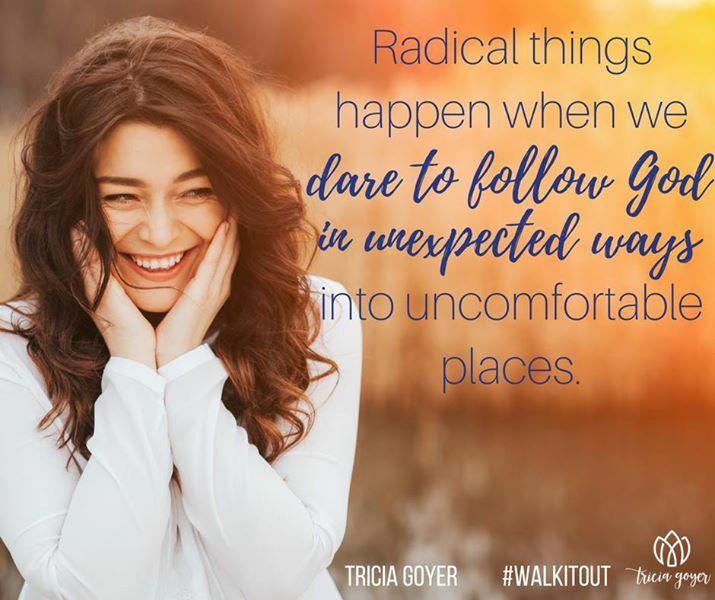 In her new book Walk It Out, Tricia shares personal stories from her life when she laid her own plan aside for God's plan. Each time she found God's plan to be far more incredible that what she could have planned. "As we mature, we realize life isn't just about us. Maybe, just maybe, God designed us for a purpose that will impact His kingdom. The purpose we all share as Christ followers is to worship God, love Him, love others, and live a godly life. But God also gave us individual things to do with our unique gifts and talents." Tricia encourages us to go to God in prayer and Bible reading and seek His plan for our life. Each chapter of Walk It Out ends with reflection questions and action steps, perfect tools to help you dig deeper. Are you ready to step out in faith? Are you ready to live out God's plan for your life? Are you ready to walk it out? 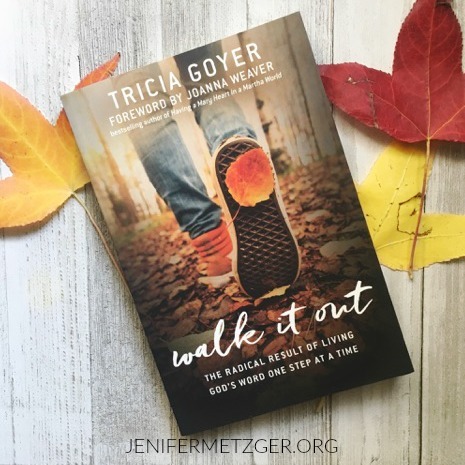 Pick up Walk It Out and learn what it means to find the radical result of living God's Word one step at a time. Click HERE to get your copy. To enter to win a copy of Walk It Out, complete each task in the rafflecopter below. I forget to ask most of the time.